“When you think about this flat (Salt River) valley, I think you have to kind of start over with what it wasn’t, right before it started to become what it would be,” he said. Gootee simply means that, in the days of the dinosaurs, the area was a mountain range, built by the same kinds of tectonic forces currently uplifting the Andes in South America. “You have these studded hills and mountains – like 10-, 15-, 20,000-foot peaks – and they’re volcanically active. And that’s what this place looked like,” he said. Then the tectonic plate motions changed, and the Southwest stretched to two to three times its former size. Like a caramel-filled chocolate bar, its surface cracked and fractured, while its “gooeyer” lower layers stretched and deformed, Gootee said. “South Mountain, the Estrellas, maybe, San Tans, White Tanks, Sacaton mountains – all of these mountains, like in the McDowell Mountains as well – those start to form as nascent mountains around 25 to 20 million years ago,” he said. Amid these fractures, some blocks of rock rose to become mountains while others dropped to form valleys. This was the birth of the undulating basin and range system that today wraps around the Colorado Plateau. The extreme topography created by these faults and blocks has since been hidden beneath millions of years of sediments and eroded gravels. “If we were out at Luke Air Force Base, and you suddenly took away all that sediment, you’d fall a long ways. You’d fall a mile and a half,” said Steve Skotnicki, an independent researcher who uses drill cuttings from water wells across metro Phoenix to map the area’s geological and hydrological prehistory. In fact, many of our mountains and buttes are actually the tips of many-miles-deep blocks, poking up like the corners of books tilting on a shelf, he said. Some comprise truly ancient rocks. The Phoenix Mountains – North Mountain down though just south of Piestewa Peak – are 1.7-billion-year-old rocks that have endured eons of punishment. Rocks in the western area of South Mountain and in the White Tank Mountains are of similar vintage. Rocks that ancient can pose particular problems for scientists trying to unravel their history, Gootee said. South Mountain arose from the hotter “caramel” layer 6 miles beneath the surface. “Twenty-five (million to) 15 million years ago, the continental crust was stretched, and the rocks in the South Mountains were pulled out from underneath that area to the northeast, underneath Fountain Hills, and brought up to the surface,” said ASU geologist Steve Reynolds, an expert on bedrock features in metro Phoenix. As it domed upward, South Mountain sent fault blocks sliding down into the valley. Today, we know these blocks as Camelback Mountain and the Tempe Buttes. 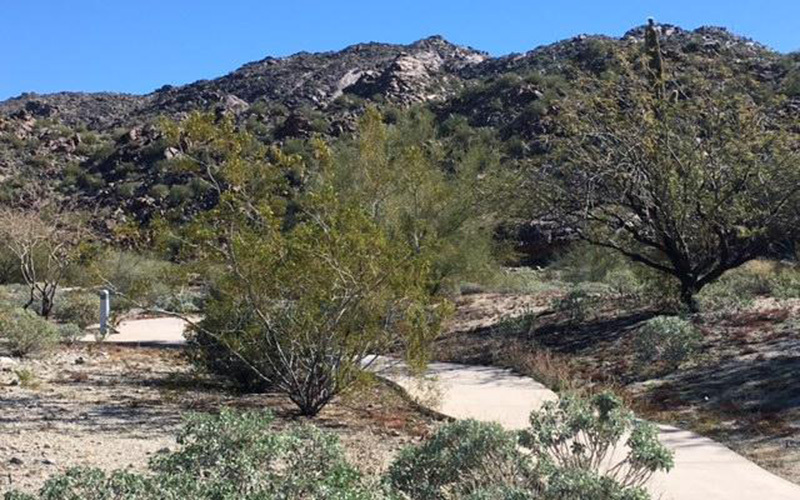 “The tilting of those blocks is what accounts for the tilted layers in Papago Park and in the volcanic rocks around the ASU campus,” Reynolds said. 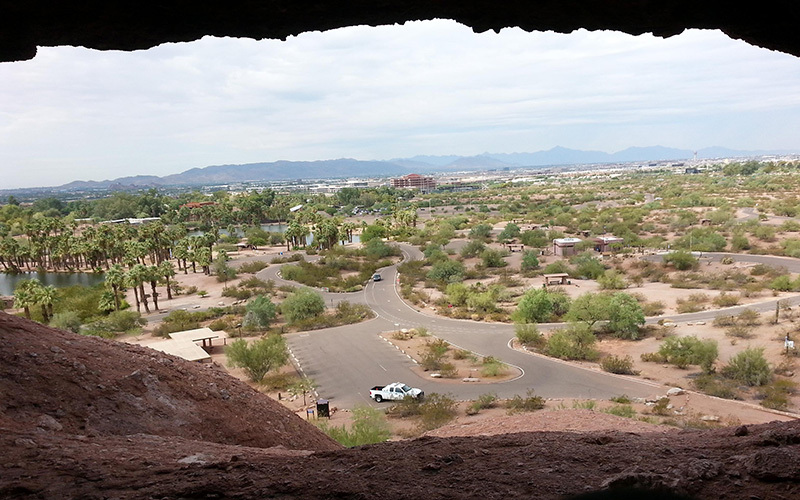 The rocks at Papago Park, including Hole in the Rock, likely were deposited by landslides along a steep mountain front that has since eroded away, he said. “There is a huge landslide block that’s probably a mile long and 30-, 40-, 50-feet thick,” Reynolds said. The “hump” of Camelback Mountain is made mainly of granite, which forms via volcanic activity underground. But the Camel’s Head Formation is composed of sedimentary rock, which forms from particles deposited on the floor of a body of water. In between the formation of the former and the latter lies a vast gap in geologic time that’s even greater than Great Unconformity visible at the Grand Canyon. The Superstition Mountains are the remains of an ancient supervolcano not unlike the one slumbering beneath Yellowstone National Park. Such volcanoes blast material skyward with hundreds or thousands of times the power of the 1980 Mount St. Helens eruption in the Pacific Northwest. Eventually, the ash and basalt that solidified inside the collapsed caldera uplifted and eroded.